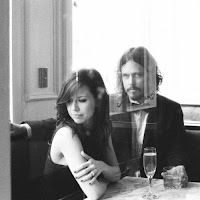 I’ve gushed about The Civil Wars a few times on here and I’m really excited to finally be able to review their enchanting debut album, Barton Hollow. Rarely does a musical group absolutely nail who they are and what they offer on the first album as well as The Civil Wars have done. But the blending that takes place between Joy Williams and John Paul White is a rare thing indeed. Joy’s sunny California pop sensibilities and John Paul’s rich, murky Alabama alt-country, while both nice enough on their own, combine to create something altogether new, extraordinary and mysterious. As great as the individual parts are, the sum ends up on a completely different level. When the two sing together, what you hear goes beyond talent and chemistry to produce a spontaneous reaction that I think surprises and charms them as much as it does us. I’ve sat with this album since November and it was the only non-Christmas album I listened to during the holidays. I couldn’t get away from it. Like a layered story that you come back to more than once to uncover new subtleties, Barton Hollow is filled with songs, melodies, characters, instrumentation and moments that unwrap themselves more and more with each repetition. The Civil Wars are immediately accessible enough to snag even the most casual of listeners, but they’re truly enjoyed and experienced best with multiple spins of the album. Love this sound!!! Sweet simplicity, NOT over done. Vocals blend so well, that they are part of the music. Nice song. Would love for country music to sound like country again... less is always better when you have a good song and someone to deliver it as well as John and Joy did. Thanks!